I don't know about you, but I can be a real cheap skate, and like any penny pincher, I'm offended that I forgot that a small DQ sundae is just 1 dollar (+tax around here). I saw the couple in front of me walk off with a pair of them, so I thought, hey, I could go for one of those. It's not huge, it's just simple and tasty, and honestly, these 300 calories were enough to tide me over for awhile.... ok, ok, I washed the sundae down with some peanuts and THEN I was full for awhile. My point is, if you are hungry for ice cream, just go get some! And if you only have a dollar, that's ok! The strawberries were very soft, so soft in fact I think I may have obliterated a few of them when I stirred everything together. The sauce is decent. Not to sweet, not to tangy. I wouldn't call it strawberry jam, but I also wouldn't call it pure strawberries either. To be honest, strawberries on top of vanilla softserve didn't do a whole lot for me. However, when I stirred the last third of my sundae together, I got a lovely (and strong) strawberry softserve that disappeared in all of 9.7 seconds. You know, I think the strawberry sundae is more filling, or maybe it's just the day, I'm not sure. I just looked and the strawberry is a smidge healthier for you at just 260 calories and a little less fat, plus it has 40% of your Vitamin C for the day, that's too funny. I had no idea strawberries are full of C! So, sorry for getting you excited with the start of my post, I really thought I had missed something at DQ. 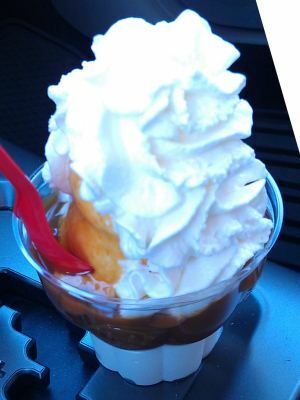 Other fast food joints have dollar sundaes, so I thought maybe DQ did too. Loved that you washed it down with peanuts! I think it looks pretty good for a dollar sundae and 300 calories isn't too bad. Just updated the post, the dollar price was a fluke, bummer! 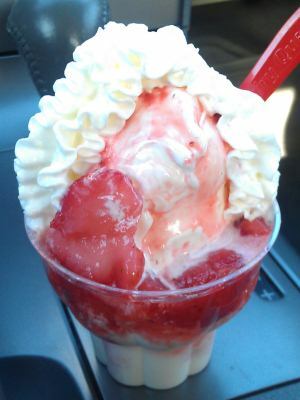 I love the look of the strawberry sundae..and i dont think 300 calories is all that bad for it..it looks like it would be way more!